If the football betting industry would be a strong, vast kingdom, the United Kingdom would surely be its capital. Maybe the numbers (in net terms) aren’t the biggest in the world, but the passion for betting on the world’s favorite game can almost be felt here. There are just so many small betting shops around to choose from, as well as games. There is a great passion for one’s home team, ranging from big Premier League clubs to lower league minnows. To say that the British love their football is surely an understatement. More often than not, it’s much more important than life and death matters. When it comes to betting on their favorite sport, however, things start to change. Some people love their old-feel, pen-and-paper, brick and mortar betting shops, which they can find on almost every street corner. We have to admit; there is something special about going around and having a few beers with strangers, discussing whether Chelsea or Man City can continue their current great form. Others, more modern, prefer online betting from the comfort of their homes, or from their smartphones. Nowadays, an awesome bookmaker is the one who can manage to accommodate as many people as possible. And while there indeed are lots of brokers to choose from, today we will focus only on one of them: Royal Panda. Although the broker has quite some years of experience outside the UK, it had only entered the market a few years ago. Their European headquarters is based in Malta, where they have also received several of their gambling licenses. At their roots, they are a casino business, and one of the fastest growing ones of the 21st century. Royal Panda has entered the sports betting world later, only to cater to that section of their customers which also fancied a bet or two. This does not mean that their betting offers are bad – on the contrary. They want to become the best in the business, and there’s only one way to do so: conquering the UK market. First and foremost in our analysis, we must discuss the bonuses and promotions that Royal Panda use to attract new customers. There is a great competition in the UK for new customers, and all brokers fight to have the best bonuses and promotions for new and old players alike. Royal Panda has very quickly shown us that they mean business. Their welcome bonus is one of the best across the UK: they will match your first deposit 100%, up to £100. One great thing about this bonus is that it doesn’t only apply to casino players – it’s also valid for their sportsbook. Whatever you want to do on the Royal Panda website, the welcome bonus stands. Sadly, this is the only big bonus which applies to sportsbook players. The other bonuses they have revolve around the casino – free spins, tournaments, game of the week, and even a loyalty program. These bonuses are great in variety as well as value, and can seriously compete with the best in the UK casino business. While they are great and all, we’ll have to ignore them and move to the next phase of our sportsbook analysis: game selection and odds. At first glance, we can safely say that Royal Panda’s offer is adequate, both in terms of sports as well as odds. We could find everything we wanted in the football category: all the major leagues and cups from Europe, as well as more exotic championships and competitions. Each game had more than enough selections to cater to any betting enthusiast’s needs, as well as most strategies. We’ve been especially impressed with the number of options available for big games: over 300. The perfect thing is that there are a lot of combined bets as well, for example, one team to win and over 3,5 goals. The same right number of selections are available for most other sports as well. We couldn’t find anything wrong with the amount of offers Royal Panda has. Odds-wise, we weren’t too surprised either. We didn’t go in expecting state-of-the-art, best-in-the-business odds, and we didn’t find them either. Don’t get us wrong; Royal Panda offers good, competitive odds across almost all sports. They are usually between 0,01 and 0,03 off the best ones for each game, but are updated very quickly and professionally. Overall, odds can be qualified as good – you won’t see lots of issues. They also offer in-play betting for most football games, as well as other sports. While this option works very good, has excellent refresh times and good odds, there are a few things which were slightly disappointing. Royal Panda’s website is structured differently from most other bookmakers – this is not necessarily a bad thing, just one that requires some getting used to. If you’ve spent your entire betting career in sites like Unibet’s or Bet365’s, you might be in for a few surprises. And not necessarily good ones. 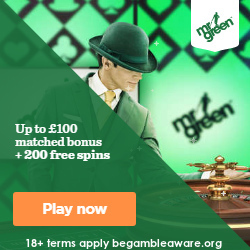 Claim Your £100 Welcome Bonus Now! Their casino, however, is nothing short of extraordinary. They have a great variety of games, ranging from classics like blackjack and baccarat to new slot games. Royal Panda also has lots of good promotions revolving around casino games, which keep them permanently interesting for customers. Moreover, some of the games even benefit from human dealers – a feat which is not as common as you might thing. Management-wise, Royal Panda fares pretty well also. Their customer support solves any issues relatively quickly, using lots of different channels: e-mail ([email protected]), online chat (between 9 and 00:30 CEST) or Phone ( + 440 203 808 3530). With the issues we’ve experienced, customer support has been very responsive and quite polite. Also, Royal Panda deals with their client’s money quite well, accepting most modern deposit methods (cards, Skrill, Paypal, Neteller, or even other prepaid cards) and also processing withdrawals quite well. To sum up, we consider that Royal Panda is quite a good choice when it comes to UK bookmakers. They have their small slip-ups here and there, but compensate with a great bonus scheme and an outstanding casino. We believe that their market share in the UK will only go up, and together with that, their offers and experience. Opening an account with Royal Panda today can only bring good things and, as always, be mindful of your betting, and just play money you can afford to lose.